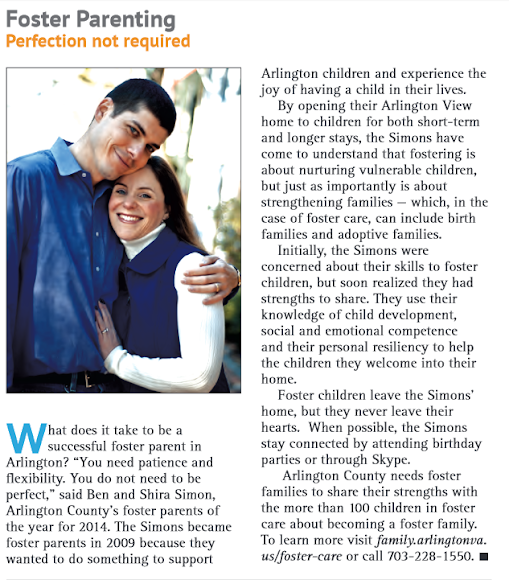 Shira and I are both humbled and flattered to be selected as Arlington County's 2014 Foster Parents of the Year. Remember that behind the scenes shot I posted a few months back? That was a snapshot I took of a video crew capturing footage for a short movie we're featured in. Tonight was Arlington County's Foster Parent Night Out, a dinner that honors all foster parents in the area. We heard a number of highlights from this last year, and let me tell you, all the foster parents are amazing. The dedication and creativity of the whole bunch really showed tonight. If there's one take away from all this press, it's that our story doesn't have to be unique. You can be the one making a difference in a child's life, you just have to jump in and do it. Regardless of whether you have kids or not, are married or not, have any experience with this sort of thing or not, you can still be an amazing Foster Parent. Yes, it's a leap, but you'll be making a profound impact in the life of a child (or children!) who desperately need it. If we can do this, you can do this. OK, I'm getting off my soapbox now. Here, watch our video. And thanks to all those who have passed on their congratulations for this honor.